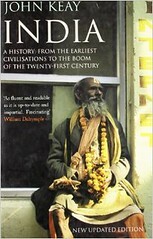 India: A History by John Keay is a meticulously researched and detailed book narrating Indian history since prehistoric times. While presenting the great and long story of India, Keay kept in mind that it should not get boring at any time and his style of storytelling is commendable. The use of maps and dynasty trees explains the points such as inheritance and expansion of a kingdom in detail. Still, this book is not a stereotypical academic history book where sunk in facts and data you will give away after some time. Neither it is an attempt to be politically correct, being used to propagate a point of view of any kind of a revisionist. Also, the author's habit of quoting from the whole spectrum of historians and also accommodating the views and justifications, from historians having views contrary to that of the author, made it one of the most neutral works on Indian history. The book starts with the pre-Harappan times and takes into account the oldest creations of archaeological importance found in India such as paintings of Bhimbetka and those of Badami caves. As with the usual historian’s approach, these paintings were used to determine the level of evolution of the human race of that time. In the subsequent chapters, the author moves to Indus civilization and rates the achievements of the Indus Valley Civilisation at par with, if not above then, those of ancient Egyptian and Chinese civilizations. Sure they did not make anything like pyramids of Giza, but the elaborate urban plan with streets and water tanks was admired by historians. Evidence of trade links with Mesopotamia civilization can be found in abundance. The author gives many possible reasons for the decline of Harappan civilization but without full certainty about any of them. This decline would again convert the subcontinent to agrarian one where each village was more like a congregation of few families led by a person known as raja of that village. Keay then moves to Vedic age and early kingdoms of Gangetic plains and present-day Pakistan and Afghanistan. Magadha would emerge as a center of Indian might and will continue to be like that for centuries. The start of foreign invasions on the subcontinent was also be discussed. He tells that not every time these invaders were disliked by the local populations. Sometimes they were invited by a king to defeat a neighboring kingdom. Many times these invaders settled here, had matrimonial alliances and would assimilate into the Indian culture, a template that would be followed for close to two millennia. Also constant would be the tales glorifying the richness of Indian subcontinent and thus in effect luring many tribes and clans to conquer India. Mauryan empire had the greatest extent and in that aspect rivaled by Mughals only many centuries later. Kingdoms in the subcontinent would continue fighting among themselves, sometimes taking help from a rival of rivals. Keay takes few Vedic concepts like 'Digvijay' where a king would try to conquer large swaths of lands in all direction i.e. enlarging his kingdom. Keay would draw a comparison with later events. Keay also discusses and finds a pattern in the dynastic succession of Mughals. During all these centuries the concept of a nation-state was almost alien to Indians and it would be no exaggeration to say that these concepts were brought to India by Europeans. Starting as traders these European companies then became rulers and Britain would surpass other European countries like Portugal, Netherlands, and France as far as wealth acquired and territory ruled is concerned. During first 100 years, they promoted studies of Indian culture and history and would enact laws to abolish traditions such as Sati Pratha and legalize widow remarriage. These actions antagonized the masses. Still, it took them decades to realize that they are being ruled by a foreign power. Then happened the 'The First War of Independence' or 'Sepoy Mutiny,' after which the British Rule became more iron-handed, but such was the irony of India that the Raj would have an equal number of friends and foes in India. Towards the end of the nineteenth century, many people of a generation went to the UK to study and these people, most of them lawyers, acquainted with ideas like nationalism, equality, socialism, revolution, and democracy, would later pronounce the death verdict of the Raj. In Indian freedom struggle, we find a unique experiment in history in which Gandhi used satyagraha and civil disobedience against the Raj. After Independence and the Partition, three countries charted similar courses initially and then became much different from each other later. I would accept that writing a history of 5000 years in a 600-page book will make few important events of history not getting the attention that they deserve but even in that condition Keay maintained the flow. His analysis of the period before 200 AD is interesting because few concrete proofs of dates and events are available and one has to rely on the rock edicts for any information about the reign of a king. The first part of the book was more interesting and newer as that period is scarcely covered and quoted in public discourse and even when done then in a highly exaggerated manner. The post-independence part is not only about India as the name of the book might suggest but is about the three successor countries and due importance has been given to events in Pakistan and Bangladesh.